Experiencing the Miraculous – DVD series with Wayne Dyer – Discount! 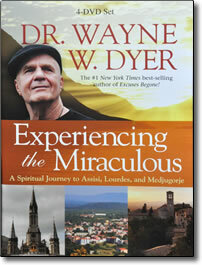 What if you could take a personal trip with Dr. Wayne Dyer to magnificent spiritual sites around the world? Now you can, without the expense and hassle of travel. Through this video series, you’ll walk the sites and experience a personal, behind-the-scenes view of this once-in-a-lifetime journey. In the process, you’ll get to know Wayne Dyer in a whole new, more personal way. You’ll visit Assisi in Italy, Lourdes in France, and Medjugorje in Bosnia-Herzegovina. At each location, Dr. Dyer gives an inspiring lecture about the sacred miracles that were witnessed there — plus his personal instructions about how you can manifest the miraculous in your own life. 4 DVD videos contain inspirational lectures, majestic scenery, and the feeling of personally touring with Dr. Wayne Dyer. It’s a program that you will watch and experience over and over.